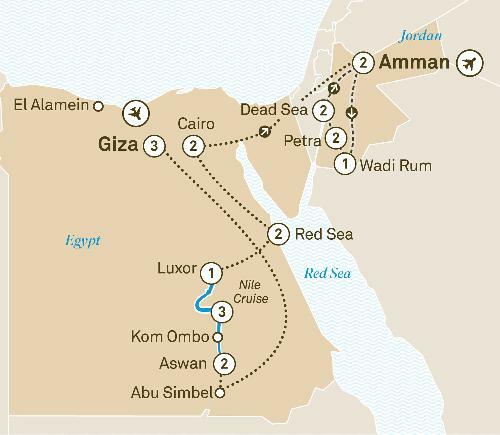 Experience the best of Egypt & Jordan on this 21 day luxury tour. See the Great Pyramids, cruise the Nile and marvel at the desert landscapes of Wadi Rum. From the majesty of the pyramids to the unrivalled beauty of the Treasury at Petra, mesmerising desertscapes, world famous seas and a cruise on the mighty River Nile, you will uncover the ancient and natural wonders of Egypt and Jordan in-depth on this magnificent 21 day journey. Discover the endless history and legacy of these two intriguing countries, from the majestic monuments immortalising Egypt’s Pharaohs and the footsteps of the Romans and Nabateans in Jordan, to the more recent memorials of the WWII battlefields at El Alamein. Dive into the Red Sea and float in the hypersaline waters of the Dead Sea, possibly while reading a book. Marvel at the otherworldly desert landscapes of Wadi Rum and the magnificent Temples of Abu Simbel and the Treasury at Petra, hewn into the desert rock.